The world of imagination sparkles to life through vibrant illustrations, and the rhythmic text makes for a joyful read-aloud. The Bank Street College of Education. Feminist Literature from Birth to Age 18. Imagination is at the heart of this book as two sisters set out to camp in their backyard. Their red tent becomes a royal shelter, the wading pool a lake, and the sandbox is the desert they toil across. The princess is stalwart, but her little sister, the panther, is unnerved when night falls. 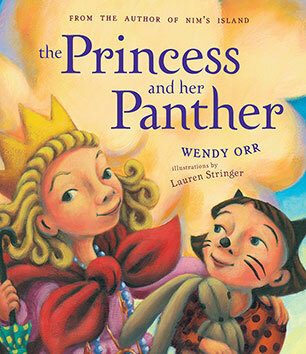 Orr’s steady refrain is, “The princess was brave, and the panther tried to be,” and the timidity of the panther is purposefully revealed in the rich acrylic illustrations… a clever twist on the usual camping story and the fears that accompany it. A little girl and her younger sister have a great adventure in the backyard. After dark, though, it gets harder to be brave. Alert children will know that it’s not leaf snakes but leaves, not an owl-witch but an owl, not a great dog-wolf but the puppy next door that try their bravery. The pictures are in broad, rich swaths of acrylic colors that deepen into night and then lighten into morning. A warm and cozy tale of sisterly joy and sweet imagination.